Next Generation® is an industrial design competition founded by Metropolis magazine to promote activism, social involvement, and entrepreneurship in young designers. This year the theme is “Energy”. The San Francisco-based firm Civil Twilight awarded $10,000 for their energy-conserving “Lunar Resonant Street Lamps” proposal. 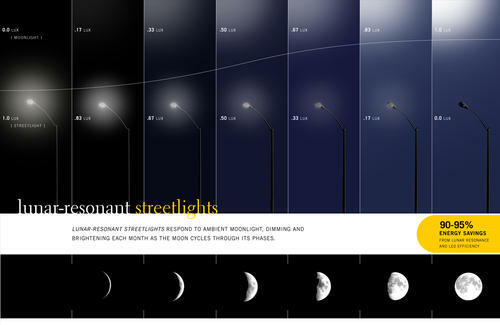 More details from Arch News now: “Replace standard urban streetlight bulbs with “lunar-resonant” units that would automatically dim or brighten in response to ambient moonlight – potentially saving as much as 95% of energy used in street lighting, while also enhancing nighttime visibility and enabling city residents to once again experience the pleasures of observing the nighttime sky. According to the team’s statistics, streetlights account for 38% of all electricity used for lighting in the U.S., and produce about 300 million tons of carbon emissions per year. In addition, their light pollution prevents two-thirds of Americans from seeing moonlight or stars. 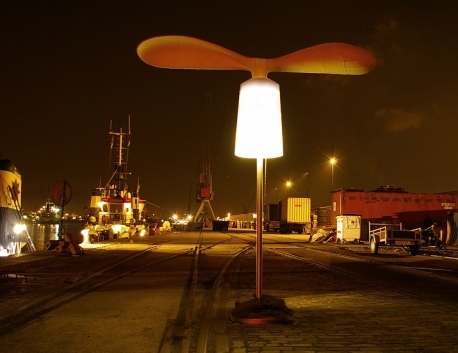 This make me think of Dutch design house Demakersvanthe’s Light Wind– a street lamp that was powered by wind.